1.) 0-100 kph is not the same as 0-60 mph. 2.) Better 0-100 and / or 0-60 mph times are always welcome. 12.0 is the best 0-100 we currently have. Because the Brutus is not a production car. It is just an experiment. It was built by employees of the "Auto & Technik Museum Sinsheim". Yeah it's shame. I don't know what is inside fastestlaps mind or why he delete that car. Argh! Brutus... Pity it was deleted, even though it had a laptime. The Brutus is awesome! I will "visit" it in August. "Best way to destroy a Prius with a caravan! :D"
America's roads are crawling with these cars, I don't hate the Prius, I just don't like hybrids. 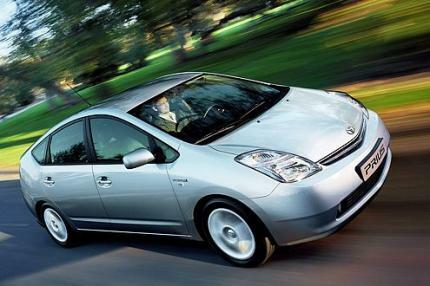 Did you see what Motor Trend did to a Prius? "In the "You asked for it, You got it." category...More bad news for Toyota- a reported problem with the brakes on their Prius Hybrid. The good news -the Prius doesn't go fast enough for the brakes to be a major issue." It has a 1.5 liter inline 4 gasoline engine backed up by an electric motor, with the cruise on or when sitting still, the gas engine shuts off, when you step on the gas pedal, like when driving in the city, the engine starts and propels the car, the battery for the electric motor is recharged every time you brake, it's recharged by the friction from the disks rubbing against the shoes. A Toyota LMP class hybrid race car using very similar technology won the 2012 24 Hours of LeMans at the LeMans Circuit de la Sarthe. And what's with that 74160 km/hr? Are we talking about cars here or sonic plane? It took only ONE second for this car to run a lap in Nordschleif? Are you fuxx'en kidding me? I drove one as a rental car once, let me tell you, as much as i despise hybrids, I'd rather have a Toyota prius than a Tesla Roadster. The Tesla is a toy, it can only go 50 miles on a single charge, so you play with it for an hour and it takes 13 hours to recharge. It's the most pretentious car in the world. Meh, I'll stick with my 5 speed Accord for fuel economy. 30 MPG and it actually has some get up and go unlike todays microcars/hybrids. There is no reason to buy this car besides it's fuel economy. It's fugly, the interior is cheap, it's not even close to being fun to drive, and it has almost no good avalible features. The same goes for the Civic Hybrid. The verdict? Get a Tesla if you have the money. A Prius doesn't have 145 ps! Last i checked it was 77.